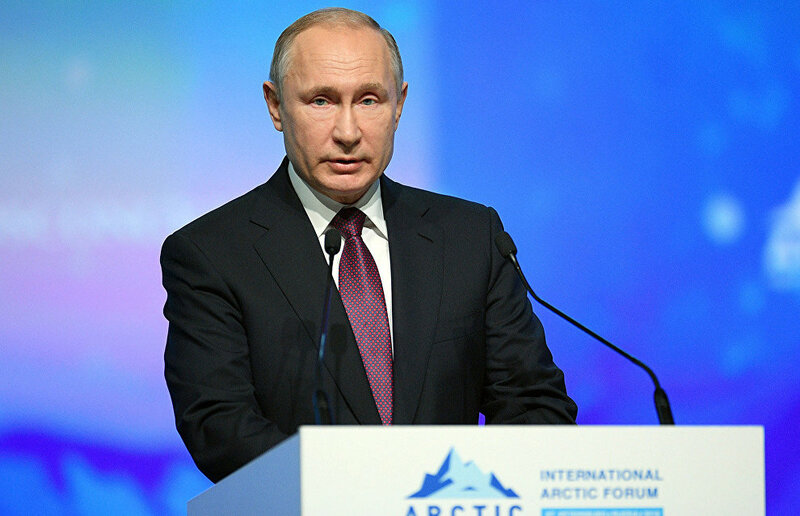 The goal to bring the freight traffic on the Northern Sea Route to 80 metric tons per year by 2025 is calculated and realistic, said President Vladimir Putin at a plenary session of The Arctic: Territory of Dialogue 5th International Arctic Forum. Just 15 years ago, this figure seemed out of reach, he added. "Our goal to significantly boost the freight traffic and bring it up to 80 million tons by 2025 on the Northern Sea Route alone was outlined in the 2018 Address to the Federal Assembly. Just 10 to 15 years ago, this figure looked absolutely out of reach, whereas today it is a realistic, carefully calculated and concrete goal," the president said. "As of last year, the volume of traffic on the Northern Sea Route already reached 20 million tons. This is three times more than the Soviet record set in 1987, when the Soviet Union transported 6.5 million tons using this route. Now, it is 20 million tons." In order to reach this goal, plans call for developing the communication and coastal infrastructure, including port facilities, navigation and meteorological aids, ensuring safe commercial navigation and renovating the icebreaker fleet. "Our goal is to make the Northern Sea Route safe and lucrative for shippers, and appealing both in terms of the quality of services and price," Putin added. The state intends to use investment support tools, including those that have been successfully used under the programs for the development of Russia's Far Eastern regions.